I love cooking and eating Italian food and was sure I already knew quite a lot about it. But, every time I read a cookbook, I find there’s always more to learn. And, who better to learn from about Italian cooking that Lidia Bastianich? Her latest book is Lidia's Celebrate Like an Italian: 220 Foolproof Recipes That Make Every Meal a Party: A Cookbook , and I received a review copy. It’s full of recipes and suggestions for serving crowds big to small at any time of day and in any season. The chapters include Aperitivi, Appetizers, Salads, Soups, Vegetables and Sides, Polenta Risotto and Pasta, Fish and Seafood, Poultry and Meat, and Desserts. Lidia shares how she likes to entertain with a spread of appetizers or stuzzichini from which guests can help themselves before the main meal begins. She makes suggestions for options with and without meat to suit any budget and season as well as any guest’s preferred diet. In the Appetizers chapter, I learned about a type of frico I’d never encountered before. I previously knew frico as a crisp, little round of browned, shredded parmesan cheese that is great on top of a salad or as a snack with a cocktail. Here, Lidia gives a couple of recipes for a larger, layered frico. This Friulian version involves par-cooking potatoes and then slicing them. Then, a mixture of polenta and grated cheese is spread in a large heated skillet; that’s then topped with some of the sliced potatoes; depressions are made and an egg is cracked into each; the remaining potatoes are added on top of the eggs; it’s then topped with more polenta and cheese. This frico is cooked like a Spanish tortilla to brown both sides in the skillet until the eggs are set. It’s cut into slices to serve. There’s also a second similar frico made with ditalini pasta, prosciutto, tomato paste, and peas. I can’t wait to try this kind of frico. Some other dishes that caught my eye include the Polenta Torta with Gorgonzola and Savoy Cabbage. It’s a layered savory cake with melted, lovely cheese within the stacked polenta. In the Vegetables chapter, Lentils with Butternut Squash and Portobellos Stuffed with Quinoa and Kale are on my to-try list. It’s clear that Lidia’s party guests never leave hungry. I had some local fennel and was in the mood for something a little lighter, so the Mussels with Fennel and Saffron was the first thing I tried. To begin, you want to make sure your mussels are clean. This time, the mussels I bought needed some debearding, but they often come completely clean. I soaked them in salt water while prepping the other ingredients. The saffron was bloomed by adding it to warming stock. I used a vegetable stock, but chicken stock is suggested. Then, in a Dutch oven, olive oil was heated and finely chopped onion and diced fennel were added. They were left to cook for a few minutes. I had an organic Italian Trebbiano d'Abruzzo I had heard good things about and was excited to use. So, that white wine, salt, and red pepper flakes were added followed by the mussels and hot stock with saffron. The pot was covered, and the mussels were cooked for a few minutes until opened. 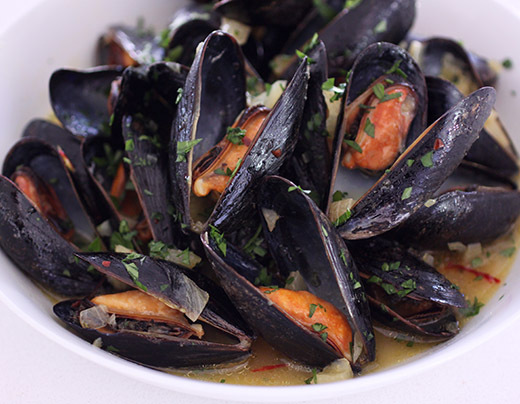 The mussels were served with the broth with fennel and topped with chopped parsley. I have a thing for saffron and always love a broth or sauce perfumed with it. It was delicious with the mussels and fennel. 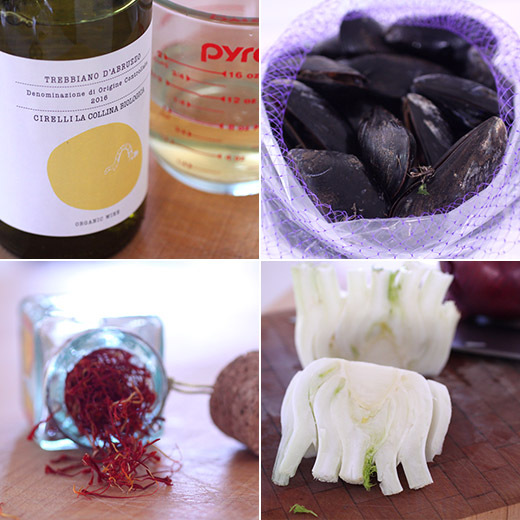 I served the mussels with big slices of focaccia to dip into the broth. For this meal, it was just the two of us. But, I’ll be looking back to this book for ideas and recipes for entertaining bigger groups throughout the year. From the book Lidia's Celebrate Like an Italian: 220 Foolproof Recipes That Make Every Meal a Party: A Cookbook by Lidia Mattichhio Bastianich and Tanya Bastianich Manuali, copyright 2017 by Tutti a Tavola, LLC. Published by arrangement with Alfred A. Knopf, an imprint of the Knopf Doubleday Publishing Group, a division of Penguin Random House LLC. You can serve this fun yet elegant dish in individual portions, piling the mussels high on each plate with a ladle. Make sure you distribute the sauce evenly and have plenty of grilled bread on the table, as well as some bowls to collect the shells. Even without the saffron, this is a delicious dish, but the saffron adds a luxuriousness that I love. 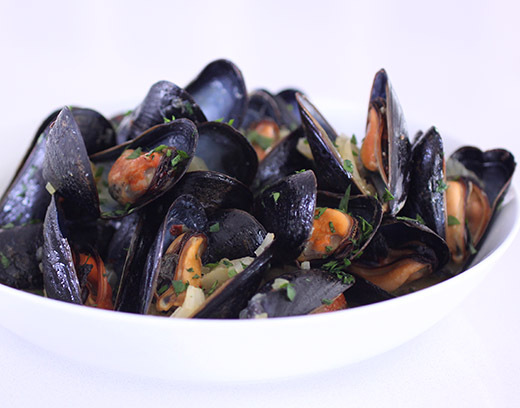 This recipe is easily scaled up; plan on a pound of mussels per person for a first course, 1 1/2 to 2 pounds for an entree. Sometimes it hits me that I read a lot of cookbooks. I love reading cookbooks. And cooking from them. Mostly I love learning new things ranging from the big ideas and amazing flavors to the tiniest details of cooking techniques. As I read my review copy of Dining In: Highly Cookable Recipes by Alison Roman, this fact that I read a lot about food became apparent because these vibrant, flavor-packed recipes brought to mind other similar dishes from other books. For instance, I knew the Blistered Green Beans with Creamy Tahini and Fresh Hot Sauce would be great because I’d previously tried the Roasted Green Beans with Tahini and Sesame-Seed Dressing from Brown Sugar Kitchen. The Grilled Corn Salad with Fresh Cheese and Corn Nuts took me back to the Corn, Green Beans, and Parmsesan Salad with corn nuts from Tartine All Day and the summer salad with corn nuts from Curate. Burrata with Tangerines, Shallots, and Watercress reminded me of how well citrus goes with burrata which I learned from trying the Blood Orange, Burrata, and Freekeh Salad from the book Citrus. Inevitably, food brings back memories, and flavors that pair well are seen together again and again. I’ve been eating smoked trout more often as of late, so the Smoked Trout with Mustard and Apples salad made with mustard seeds and frilly mustard green leaves looked delicious. And, the Skillet Chicken with Crushed Olives and Sumac looked like a fantastic result from not too much effort. The first dish I tried presented a new and different idea I’d never seen before. 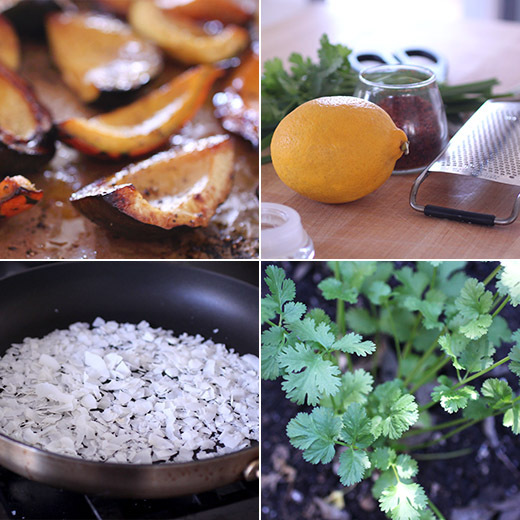 Toasted coconut chips became a central element in a gremolata for sprinkling over roasted winter squash. Turns out, I have added coconut chips to a winter squash salad before, but that was part of a very different dish and had nothing to do with a gremolata. 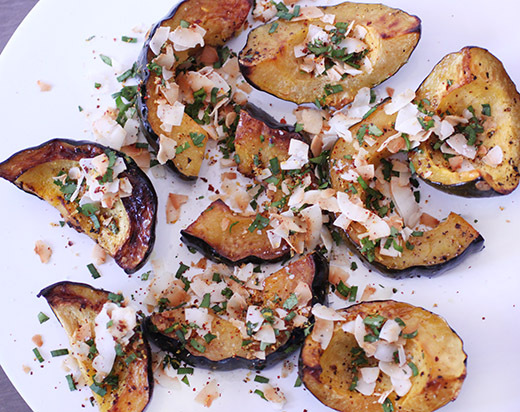 Here, winter squash was sliced and roasted after being tossed with melted coconut oil. I used acorn squash, but delicate is shown in the book. For the gremolata, unsweetened coconut chips were toasted in a dry pan and left to cool. Chopped chives and cilantro leaves that I was able to harvest from my herb garden were added to a bowl with lemon zest, Aleppo pepper, and salt. The coconut chips were added and tossed to combine. 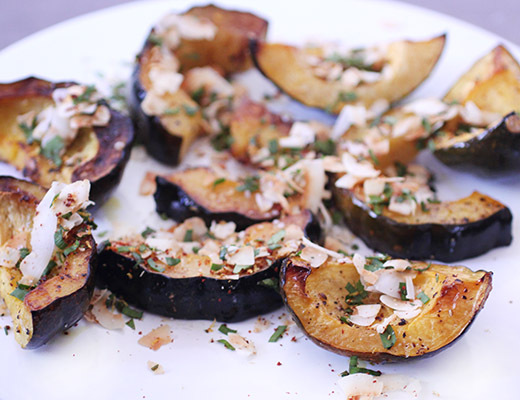 This gremolata was sprinkled over the roasted squash pieces before serving. Winter squash and coconut go great together, and sweet potato wedges would be a delicious alternative as well. The lemon and Aleppo pepper added nice punch to the mix of flavors. It’s fun for me to connect the dots of ingredients and pairings that I encounter from book to book to book, and mostly it’s a lot of fun to eat what ends up on the plate. Maybe I’ve been watching too many documentaries lately, but I was intrigued that the introduction to Night + Market: Delicious Thai Food to Facilitate Drinking and Fun-Having Amongst Friends started with a Werner Herzog reference regarding the difference between objective truth and ecstatic truth. The filmmaker defines objective truth as a record of facts while poetic, ecstatic truth is reached through “fabrication and imagination and stylization.” Kris Yenbamroong, the author of the book of which I received a review copy and founder of the LA restaurants, explains that his cooking is the ecstatic truth of Thai food. The recipes are definitely Thai in origin, but they are translated with his preferences. They don’t necessarily fit a strict definition of traditional Thai cuisine. You’ll find classics like Pad Thai and several variations of Larb, but the particular way they’re presented here are the author’s own style. The other intriguing aspect of these dishes is that they are intended to be paired with alcohol. There are no hard and fast rules, just lots of tips for which dishes to serve together as a meal and ideas for drinks to go with them including several wine suggestions. But mostly, the book encourages the cook to try these recipes and discover your own favorite ways to serve them for family and friends. One dish I can’t wait to try and that I will alter slightly is the Jungle Curry Clams. Jungle curries are hotter and more intensely flavored than others that include coconut milk. And, typically they’re made with water fowl, fish, or pork. Here, clams are used along with ground pork which I would skip or replace with chicken. The Hot and Sour Soups all sound great with lemongrass, galangal, and lime leaves. The Banana Blossom Salad is something I’ve wanted to try for ages but have never located banana blossoms to use. Throughout the book, there are practical substitution hints, and here endive is mentioned as a good alternative to banana blossoms. With all the suggestions for various ways to serve each dish, the condiments and the included recipes for those condiments, and the encouragement to find out how you prefer to enjoy each recipe, this book inspires creative freedom with this food. 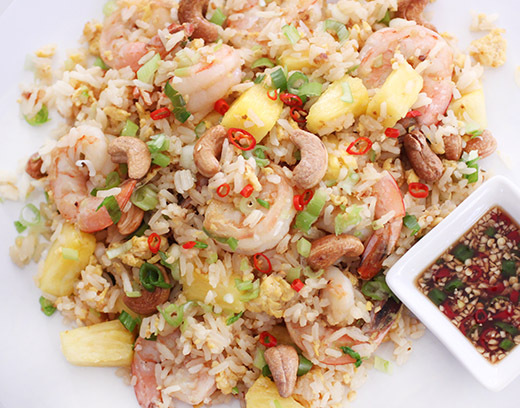 Fried rice is one of my all-time favorite things, and I had to try the Pineapple Shrimp Fried Rice. For all the fried rice recipes, a homemade Stir-Fry Sauce is recommended. It’s a simple sauce that’s sweet and savory with oyster sauce and sugar. I took a short cut when I found a bottled Stir-Fry Sauce that’s made with those same ingredients. The other condiment to make in advance for this is the Prik Nam Pla which is a mixture of fish sauce, lime juice, minced bird’s eye chiles, and minced garlic. And, of course, you want to have all the ingredients chopped and ready before you start heating the wok. With hot oil in a very hot wok, you start with onion and garlic before briefly cooking the shrimp. Next, egg is added and scrambled into the onion and garlic. Then, leftover jasmine rice is added with the stir-fry sauce, and you cook while tossing everything together until the rice is dry and browned from the wok if you like. 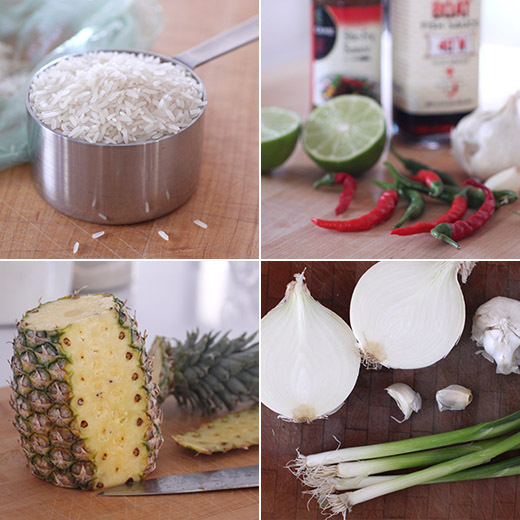 Off the heat, pineapple chunks and toasted cashews were added with sliced green onions and ground white pepper. In the book, this fried rice is shown being served in a hollowed-out pineapple, but I went for a simpler presentation on a platter. The Prik Nam Pla was served on the side to add to each plate as desired. 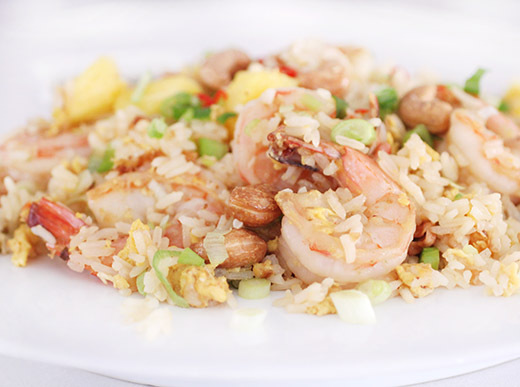 I was already a fan of fruity and spicy things mixed with seafood, so this fried rice was a winner for me. There are some distinct flavors here with the sweet-savory stir-fry sauce and white pepper, but my favorite element was the Prik Nam Pla that I generously spooned on top. There’s so much more I want to try from this book, and I love that it not only gives license to but encourages a bit of a break from complete authenticity.